The city lies in a fertile, agricultural area, watered by the Primero River, also called Río Suquia, which runs through the city. The province is scenic, with other rivers, lakes, and valleys. Together with the mild climate, this was an ideal spot for early settlement on the colonial route between Lima and the Atlantic. Founded before Buenos Aires, Córdoba was the first capital of the country and is now Argentina's second most important city. It's growing in commercial importance, with an automobile industry and an expanding tourism industry. 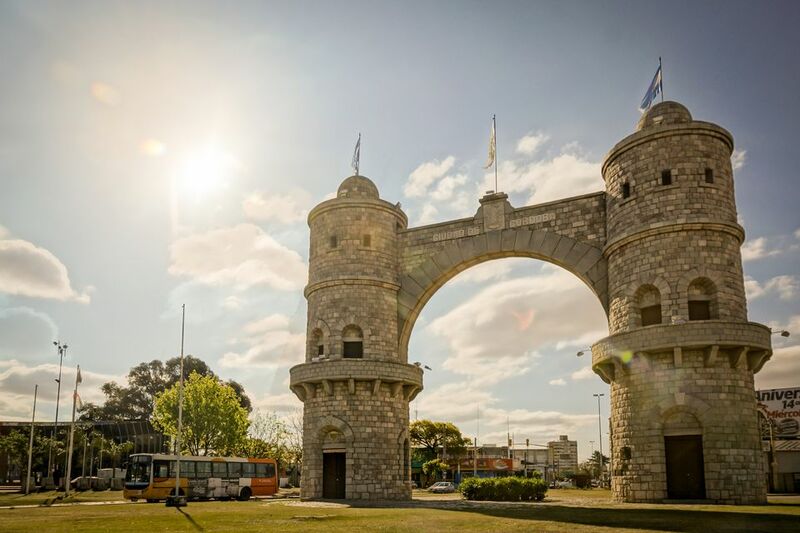 The combination of colonial past, modern buildings and a convenient base for exploring the nearby Andes and the Pampas make Córdoba a favored spot for conventions and language schools. Its location provides the arena for many adventure and/or extreme sports. Daily domestic flights from Buenos Aires, Mendoza, and other Argentine cities, plus international flights from Latin American cities. All flights, by Varig, Aerolineas Argentinas, Transbrasil, Lloyd Aeroboliviano, SW, Austral, LAPA, Dinar, TAN, and Andesmar, arrive and depart from Taravella Airport, a thirty-minute cab ride from central Córdoba. There are also some cheap flights to Córdoba, Argentina - Pajas Blancas Airport. Córdoba's new bus station is more than just a place to catch a bus. With banks, a pharmacy, a travel agency, first aid, day care, telephones, post office, shops and restaurants, it serves a number of bus companies providing service to and from many Argentine cities. Long distance buses offer free movies, free meals, and comfortable service. Around town, black and yellow metered taxis. Take a city tour aboard a red British double-decker bus. Though the seasons vary, Córdoba's weather in fall is pleasantly warm, with mostly sunny days and some rain. Winter is cold and dry. Spring starts the humid weather, as the rainy season begins and continues through the summer with daily thunderstorms. With the city courting the convention business, many of Córdoba's hotels are accommodating large groups, but there are many choices. There are options outside the city, such as ranches now turned guest or "dude" ranches like Estancia Corralito that specialize in dove shooting. Like the rest of Argentina, people in Córdoba like their meat. Argentine cuisine varies a little from province to province, and in Córdoba, the traditional Asado, locro, stew with corn as a primary ingredient, empanadas and lomito (skirt steak) sandwiches are popular, as is Bagna Cauda, the anchovy dip for vegetables and bread that Italian immigrants brought with them to Argentina. Naturally, all these dishes are enjoyed with an Argentinian Wine. Cultural - in addition to the main cathedral, Iglesia Catedral, there are many more churches, including the Iglesia de la Compañía, which is located with other Jesuit religious and secular buildings in the colonial headquarters of the Jesuit Missions in what was then part of Paraguay. Included in this block are a school, a university and library, and the Cripta Jesuítica del Antiguo Noviciado that were named a Cultural Heritage site by UNESCO in 2000. There are also dozens of museums, ranging from the Museo de la Ciudad (Cabildo), art, history, natural arts and sciences, children's museum. Parks - El Parque Sarmiento offers strollers many walks around the gardens, a zoo, a Greek Theater, amusement area, a lake, swimming pool, places to eat, bars, cycle track, and for many years was the only large park area within the city limits. Nightlife includes a casino in nearby Carlos Paz on the shore of San Roque Lake. Surrounding areas to see include Cerro de Pan Azúcar with great views of the city; La Falda, a resort area on El Cuadrado hill is exceptionally scenic with good climbs; the colonial chapel, Capilla Nuestra Señora del Rosario de Candonga, once was part of the large Jesuit estancia at Santa Gertrudis; another Jesuit church with better survival is the one at Jésus María, which now forms the Museo Jesuítico Nacional de Jésus María.